Les Vigneaux is approximately 1150 km from London. By train you can take the Eurostar from London to Paris Nord then take a high-speed train from Paris Gare Lyon to Oulx (Italy), an 8.5 hour journey. 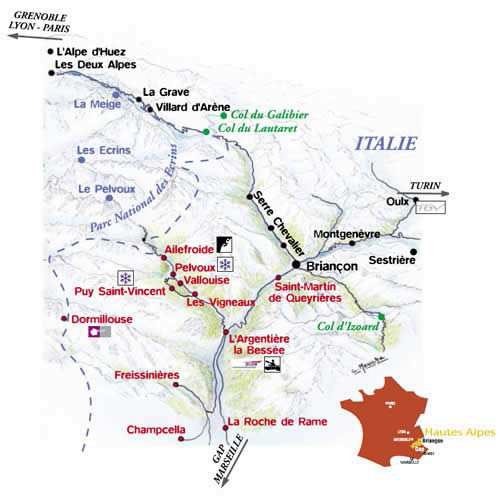 You can then hop on the shuttle bus service to Briançon (1 hour). You can also fly to Marseille, Lyon, Grenoble or Turin. 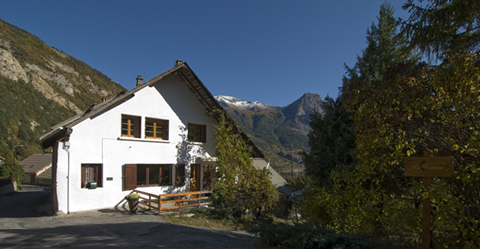 You can organise a transfer from the airport to our apartments with The Alpine Transfer Company. 1) In the village of Prelles, turn right (D4) before the bridge over the Durance river and follow the beautiful windy road to Les Vigneaux. In the village, take the first right (towards the church – chef lieu). We are the second block of houses on the left-hand side (white house with a fence around the patio). You can park close to the apartment by driving down the steep path that passes in front of the house. You can also continue a little further and then park right (diagonally opposite the church). 2) In the village of Prelles drive straight ahead over the N94. In the village of Argentière, turn right (signs Vallouise / Pelvoux) and drive down the hill. At the lights, turn right towards Vallouise. After the hamlet of La Batie des Vigneaux take the first right (no sign) that goes uphill. At the T-junction, turn right. Take the first left (towards the church – chef lieu). We are the second block of houses on the left-hand side (white house with a fence around the patio). You can park close to the apartment by driving down the steep path that passes in front of the house. You can also continue a little further and then park right (diagonally opposite the church). Follow the N94 towards Briançon. In the village of Argentière, turn left (signs Vallouise / Pelvoux) and drive down the hill. At the lights, turn right towards Vallouise. After the hamlet of La Batie des Vigneaux take the first right (no sign) that goes uphill. At the T-junction, turn right, then take the first left (towards church – chef lieu). We are the second block of houses on the left-hand side (white house with a fence around the patio). You can park close to the apartment by driving down the steep path that passes by the front of the house. You can also continue a little further and then park right (diagonally opposite the church).